Join the SF Bike Party for a leisurely 12 mile ride through the city, with stops along the way to socialize and party. You’ll meet up at 7:30 PM at Giants Stadium, Willie Mayes Gate and start riding at 8 PM, ending at Civic Center. Check out the blog for more info and riding directions. Remember, bring positivity, stay in the right lane, and please stop at red lights. This month’s theme is “Birthday Party”! You’re probably familiar with Mix Master Mike from 90’s era Beastie Boys albums. But his turntable talents have continued to grow during the past decade, winning three consecutive DMC World Championships and dropping new albums. Check out his famous scratch routines at Yoshi’s (1330 Fillmore Street, SF) starting at 10:30 p.m., $20-$25. All ages. Check out SF’s Tape Music Festival at Ft. Mason this Friday, Saturday, and Sunday at 8 PM for an avant garde peek into experimental music, art, and live sound projection. Plus, they have an underemployed discounted admission rate of only $8 a night. Otherwise it’s $15 for one day admission, or $30 for the 3-day festival pass, tickets are here. Want to go riding in Tahoe but don’t want to drive in snowy conditions or stay overnight? Hop on the popular one day Ski Bus (discount codes can be found here) and have everything including lift tickets taken care of for you, for as little as $99. There’s an early pick-up in Mission available, sign-up before it’s filled! 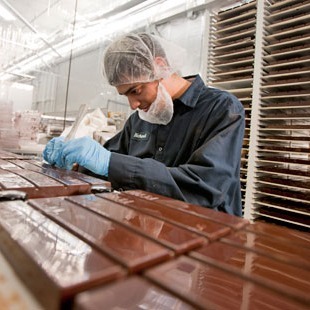 TCHO has finally started offering limited guided tours of their factory at Pier 17 (Embarcadero at Green St.), complete with a tasting of their scrumptious artisan chocolate. The hour long tour also covers the history of chocolate, TCHO’s Fair Trade practices, and how they make chocolate from scratch. Tours are free, but reserve ahead of time here.